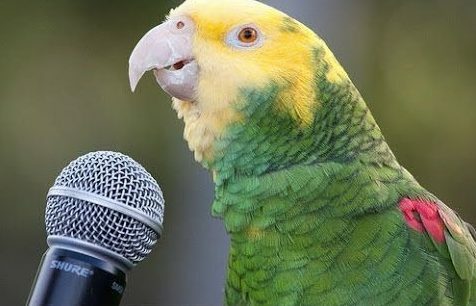 Did you know that parrots can be trained to say up to 200 words and short phrases. In fact their ability to mimic human language is so well known that many parrot owners initially purchase the bird for this reason alone. The truth however is that like most talking birds they’re not really talking but mimicking the sounds they hear around them. They certainly don’t have any real understanding of the words they repeat and what’s more interesting is that parrots as a species are not the best of the bird mimickers. Yes that’s right the top word mimic is actually the Mynah bird. Their ability to create amazingly realistic human and non human sounds such as words, coughs, sneezes and even cell phone ring tones is well documented. Other birds that are extremely intelligent and known to mimic human words are crows, ravens and jackdaws. Although their abilities are less publicized. This article is a bit misleading at best. It has been demonstrated in recent years that parrots can indeed understand the human words that you say they are only mimicking! Many continuing experiments with African Grey parrots clearly and unambiguously demonstrate that these birds can be taught to “mimic” human words and actually understand what those words mean. These parrots can distinguish between color, texture, and shape. They can also grasp many numbers. This is important research with which you may wish acquaint yourself! EDIT: I meant to say above, that parrots distinguish between things using human language, and indicate a grasp of numbers using (saying) human words. They can indeed be taught to have a rudimentary command of some parts of human language. Thus, their use of human words is actually far beyond just mimicking without understanding! That’s very interesting what you’re saying however no one is saying these animals aren’t intelligent. Each animal is an intelligent being and can naturally know how to do certain things. e.g. it can identify various foods, times of the year, times of the day all related to it’s built in instincts. Parents within the animal kingdom pass on certain hunting techniques and survival skills to their young. That’s an absolute and one that no one is denying. However when it comes to linguistics and understanding the language I don’t think they can. However if you have data, articles, links to show that animals have a true understanding of the words they say and can build sentences similar to how humans are able to. Then yes certainly I’d love to see them.